Beautiful desert landscape can be found in Nevada along the Spring Mountains and the Red Rock Canyon area, this picture shows the snow covered Spring Mountains in winter. 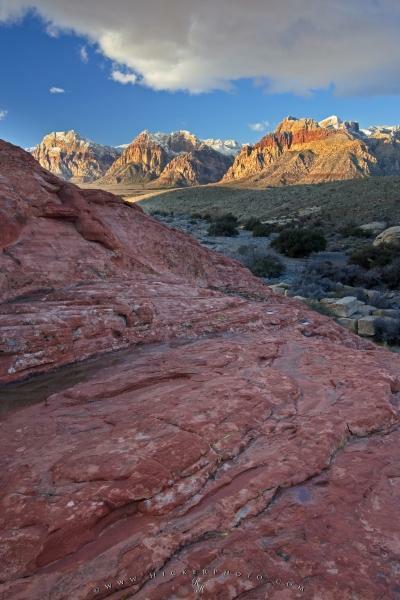 Along the trails from Sandstone Quarry viewpoint in Red Rock Canyon National Conservation Area you can find some great photo locations for scenic and landscape pictures. The red rocks are often giving a strong foreground for some desert landscape photos. This photo was taken in February after a heavy snowstorm in the Spring Mountains just after sunrise, I used a neutral grad filter to balance the exposure and to bring out more details in the red rock, which I used to lead into the frame of this desert landscape picture. Region of Sandstone Quarry viewpoint, Spring Mountains, Red Rock Canyon National Conservation Area, Park road of Red Rock Canyon National Conservation Area and snow coverred Spring Mountains, Nevada, USA. Photo of a desert landscape in winter, with snow covered Spring Mountains, Red Rock Canyon, Nevada. Pictures from photo gallery "Landscape Pictures"
This picture is part of the photo album "Landscape Pictures" - there are more beautiful images waiting for you.